Chancery Lane is a 100,000 sq ft office and retail development situated in Midtown. Construction started in Q3, 2014 and is programmed to be complete in Q3, 2016. 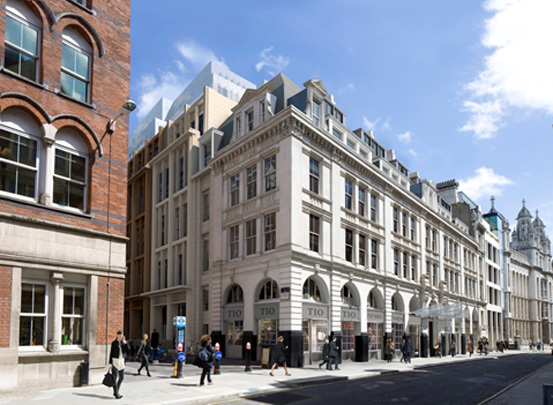 Whilst respecting the heritage of Chancery Lane, the scheme has been designed to respond to the enhancement of the local area and changing occupier profile. Above the retained façade on Chancery Lane and the new ceramic dressed elevation on Breams Buildings will sit a terraced glass cube providing spectacular space and flooding the buildings internal atrium with light. The completed building will appeal to all sectors of the market seeking high quality space in a premium business location.